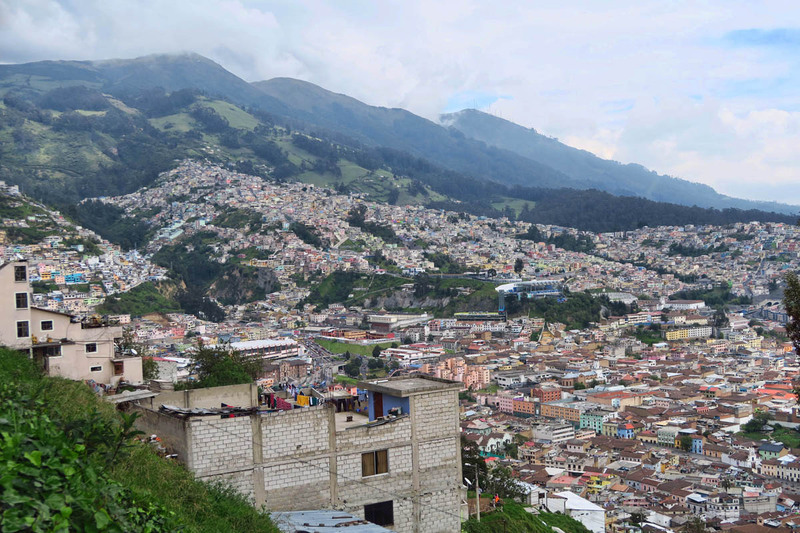 I had “theft” on the brain from the moment I landed in Quito, Ecuador. I don’t typically give much thought to petty theft and street crimes, having lived in Manhattan for ten years. I have accepted that theft can happen anywhere, so I do what I can to protect my personal belongings, keep them out of view, and stay alert and aware when walking the streets of any large city. Then I try not to think about it too much. Accepting the risks while arming myself with local knowledge, I refuse to let fear dictate my decisions. 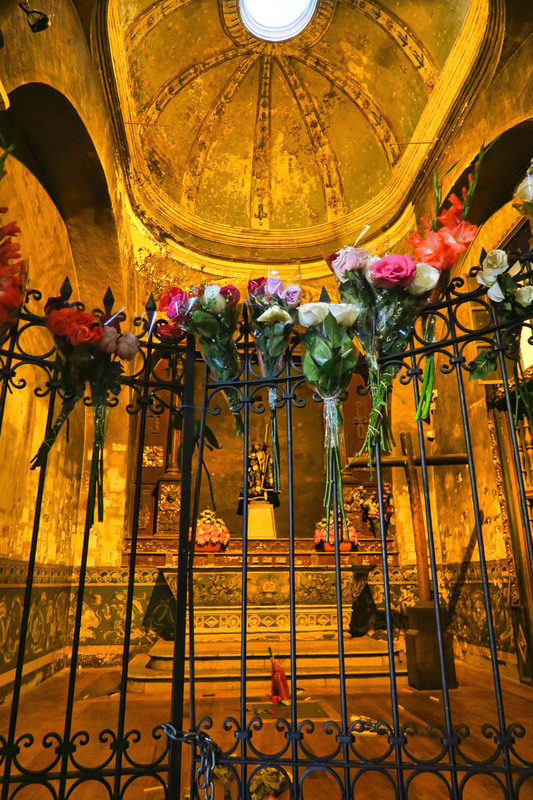 I try instead to focus my thoughts on traveling in safe environments and positive outcomes. Having been a victim of petty crime only twice in the over 70 countries I have visited (Brussels in 1980, and London in 2002,) it’s a strategy that has served me well. 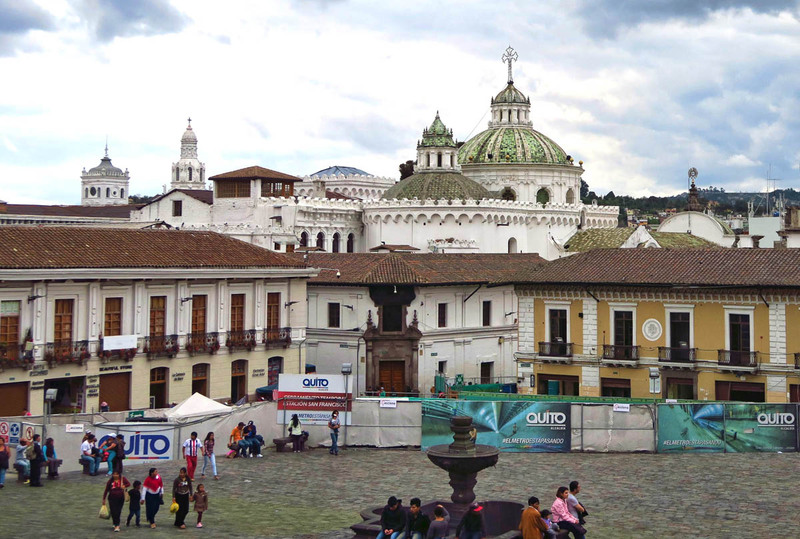 Plaza Grande is at the heart of Quito’s Old Town, UNESCO World Heritage site since 1978. 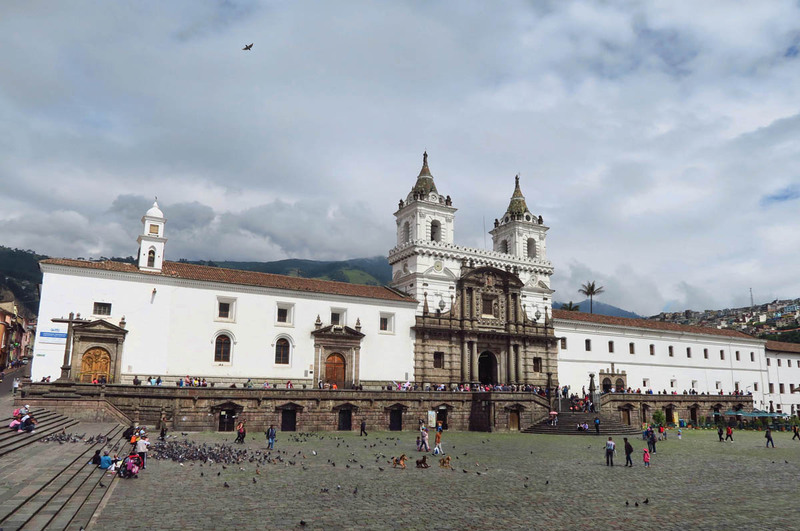 The busy square is home to many examples of the baroque style from the Quito School of Art, founded in 1552. 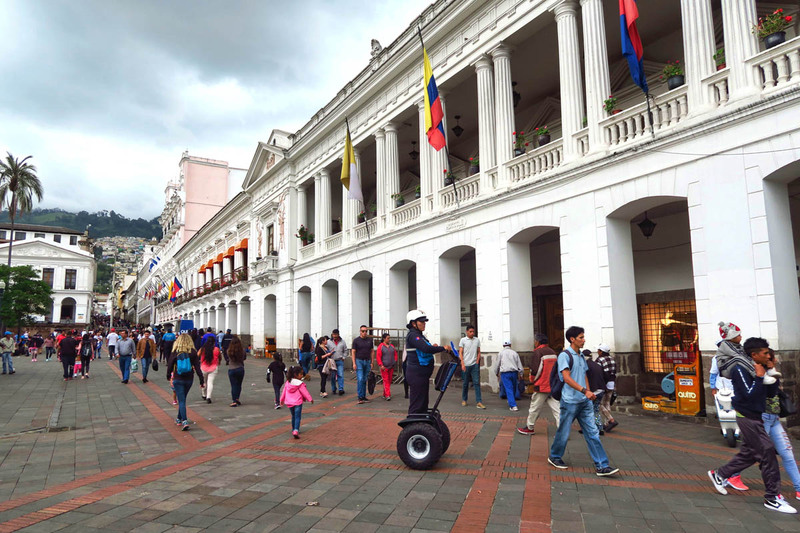 Modern transport for police in the plaza. 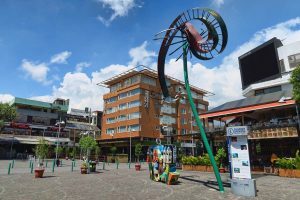 Plaza San Francisco, one of the many outdoor plazas in historic Old Town. 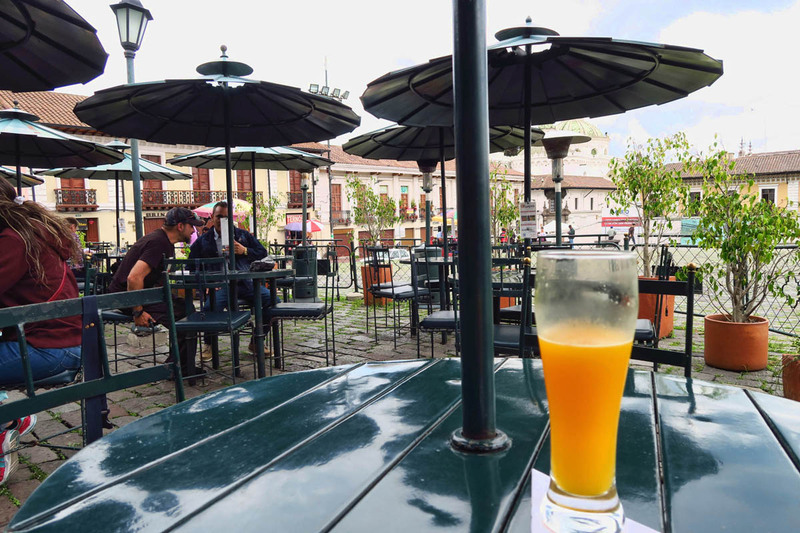 One of my favorite things about Ecuador was the availability of fresh juices, this one “maracuya” or passion fruit, enjoyed in Plaza San Francisco. 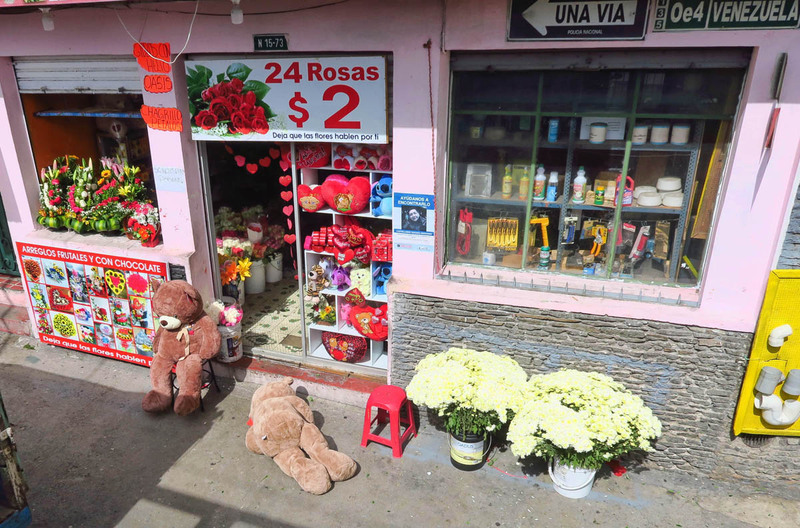 Quito, being so close to the equator, only has two seasons, winter, and the dry season. In winter, there are very few blue sky days making photography a challenge. 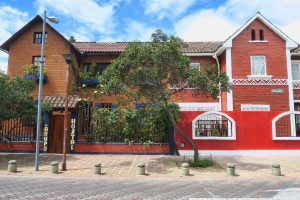 But in reading countless warnings in the Lonely Planet, Trip Advisor, and practically every article I read describing all the different schemes and scams one could potentially fall prey to in Ecuador, I was on edge from the minute I landed in Quito. When going out into the streets, I trussed myself up under layers like a flack jacket, my valuables so well secured that even I would have struggled to reach them at gunpoint. I felt secure, and I felt prepared with “decoy money” in my pockets, duplicate copies of all my documents, and all my valuables safely stashed out of sight back in my hotel room. Or so I thought…. I had taken all the precautions to protect my things while on my person, but never once considered that I would fall prey to theft in my vacant hotel room, particularly in the homey Hostal Arupo, which had a fortress-like front locking gate. 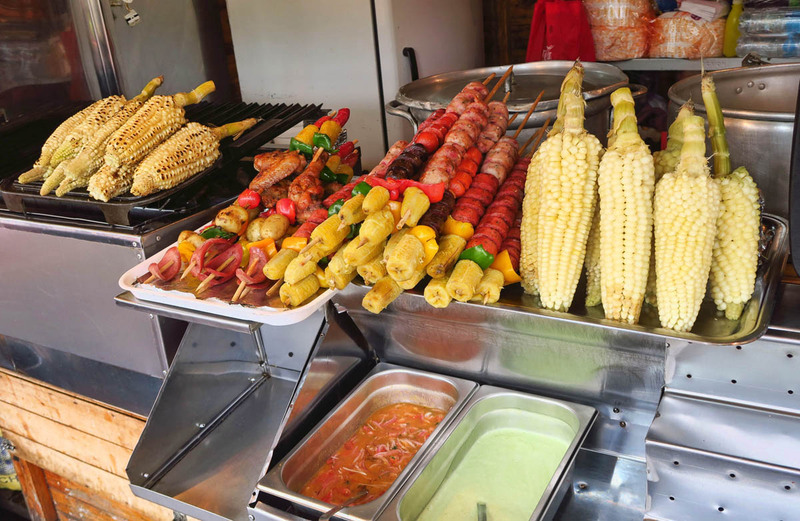 From what I experienced, street food is not as prevalent in Quito as it is in Mexican cities, nor as tasty. 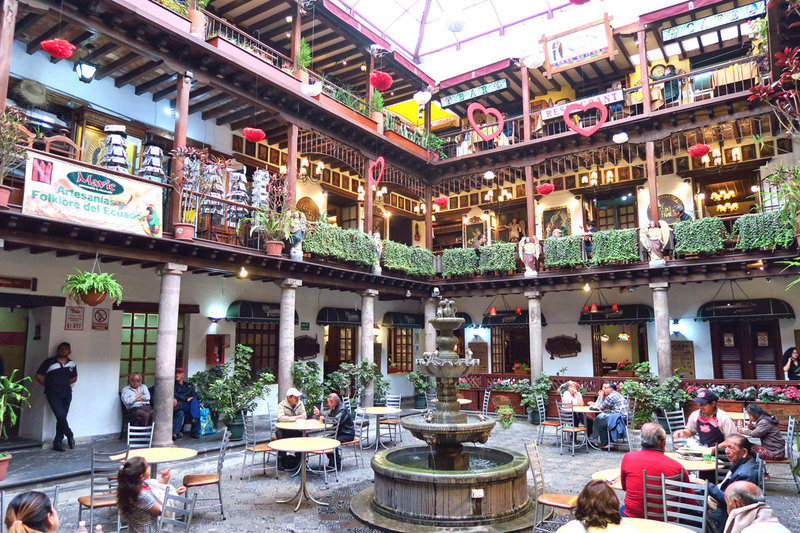 Old Town Courtyard containing coffee shops and fast food restaurants. Many small hotels and pensions outside the US will encourage you to leave your room key with the front desk when you go out, the premise being that it is safer in their care than in a bag that can potentially fall prey to pick pockets. 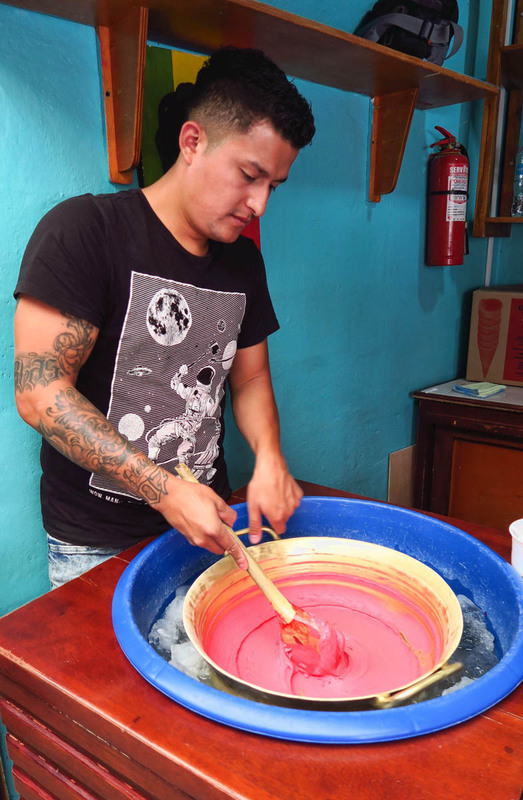 I followed this rule of thumb in Hostal Arupo, which may have been my big mistake. The “pigeon hole” wooden box holding the keys, each with a numbered “pool ball” dangling from the key ring, was in full view of guests from across the counter, making it easy to tell which rooms were vacant. I believe my room key, left behind in full view may have been what invited the thief, whether s/he be local or transient, into my vacant room. On the heels of my unfortunate incident, I would have been on the red eye flight back to the US that night were it not for two reasons, one being my brother’s encouragement not to end what had been a phenomenal trip on a bad note. But also, my Canon G7X camera was in the repair shop, having suffered an unfortunate fall from my jacket hanging on the back of a chair (another misstep I made due to fear-based thinking, as I took it out of its usual protective case so it would fit in a smaller internal pocket.) I couldn’t exactly walk off leaving a $600 camera behind on the “operating table.” While waiting on the repair, I had time to overcome the shock and assess my willingness to continue on. I’d only been in Ecuador for two days. So rather than bolt back on the first available flight headed back to the comfort of home, I reluctantly decided to take it one day at a time…at least until my camera was repaired. 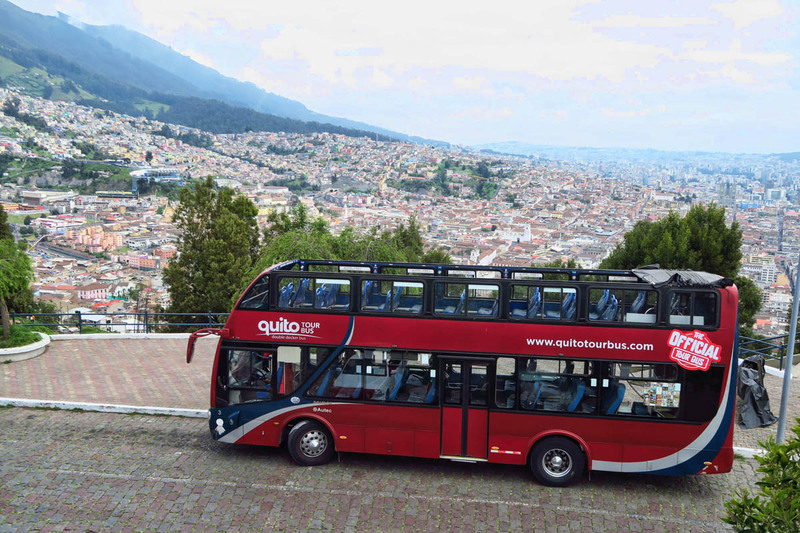 One of the best ways to explore Quito is on their Hop On/Hop Off, double decker bus tour for $15. It takes 3 hours to complete the entire route if you don’t get off. I made the complete loop first, then went back around to get off at a few stops. 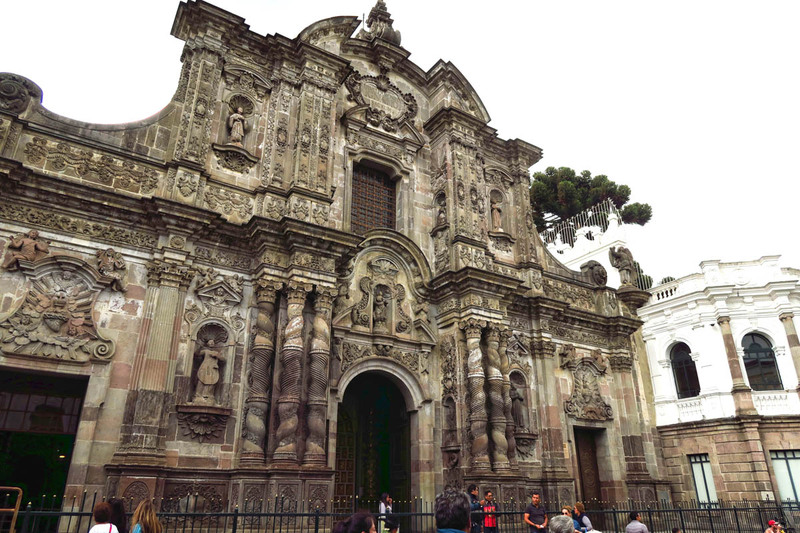 Great way to spend the day in Quito! 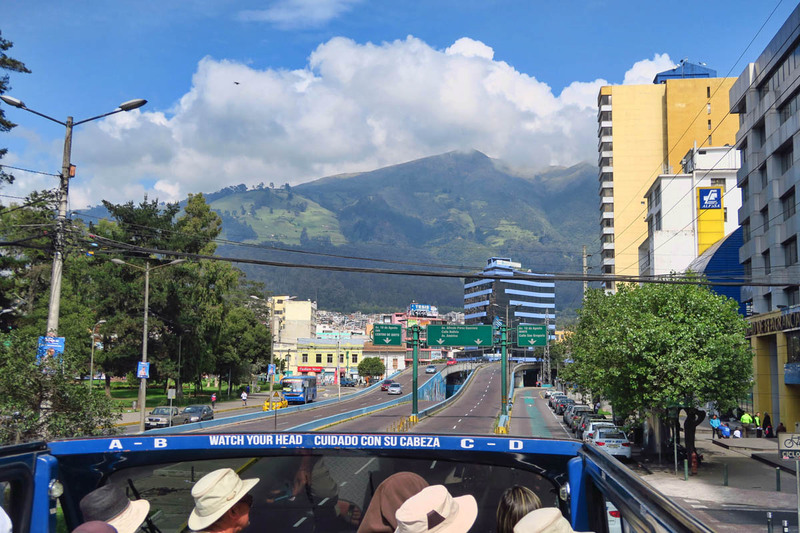 Riding in the upper deck of the Quito Tours bus gives great perspective of the hills in Old Town. 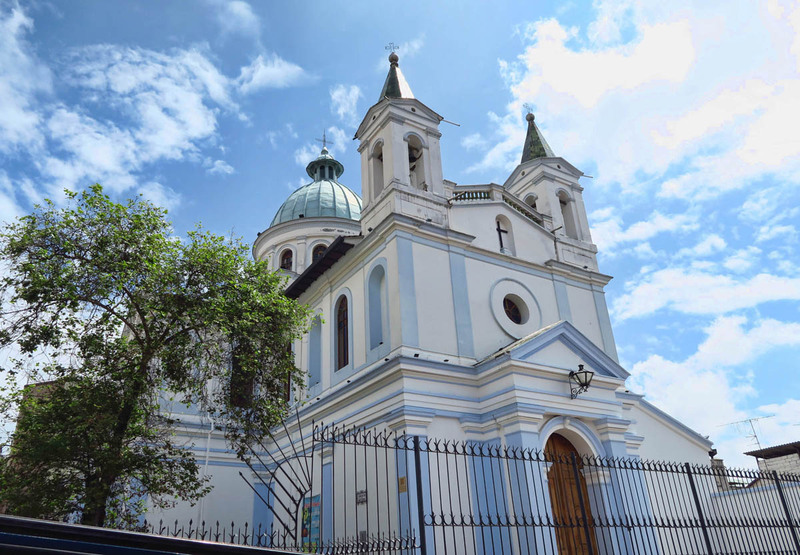 The roofless tour also allows great views of some of the architectural features of the historic city. One of the stops along the tour climbs up to the El Panecillo lookout. 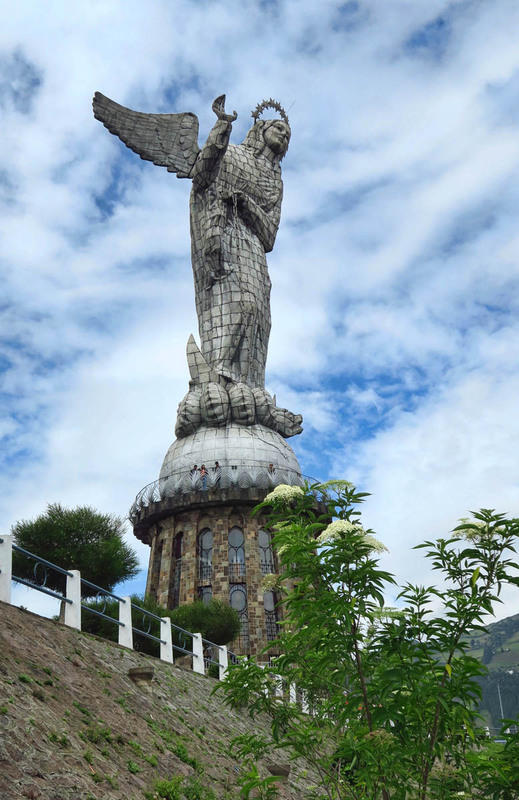 At the top of El Panecillo lookout is the statute, La Virgen de Legarda, built in 1976 from 7,000 pieces of aluminum. 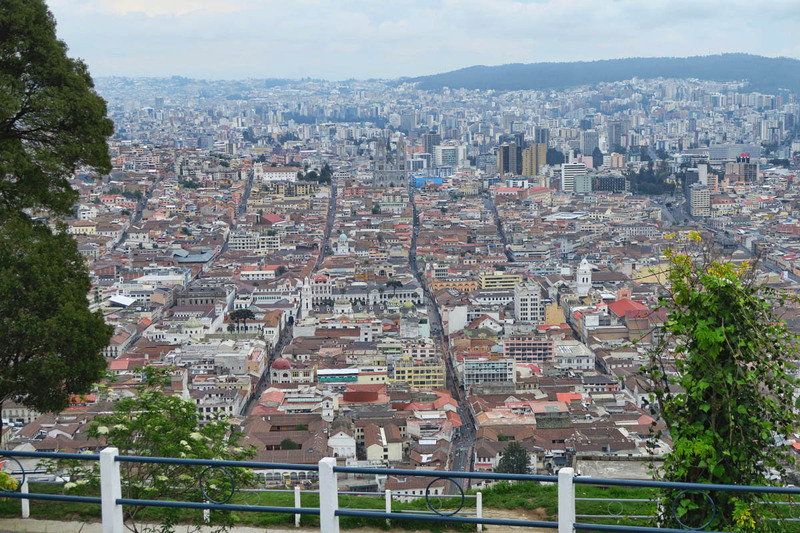 The view down over the colonial city is beautiful from the hilltop. 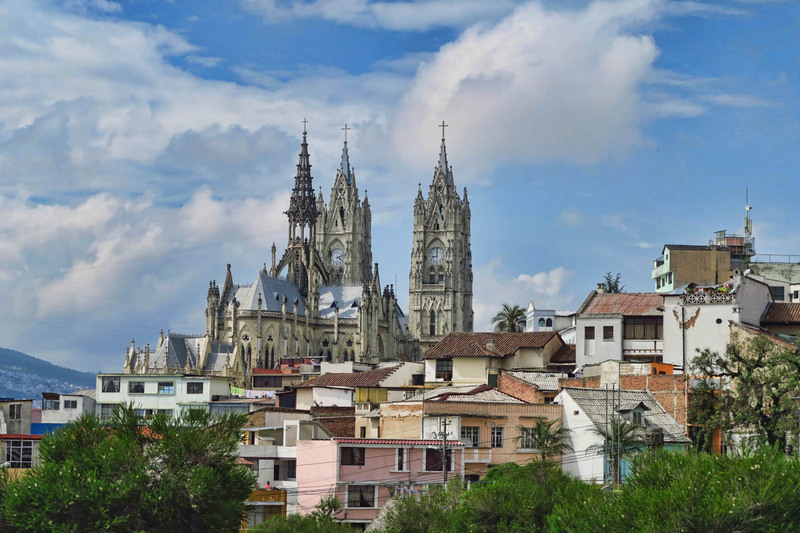 Quito is Ecuador’s capital city. At 9,350 ft, it is the highest capital city in the world (a title often debated with La Paz, Bolivia, though its constitutional capital is Sucre.) 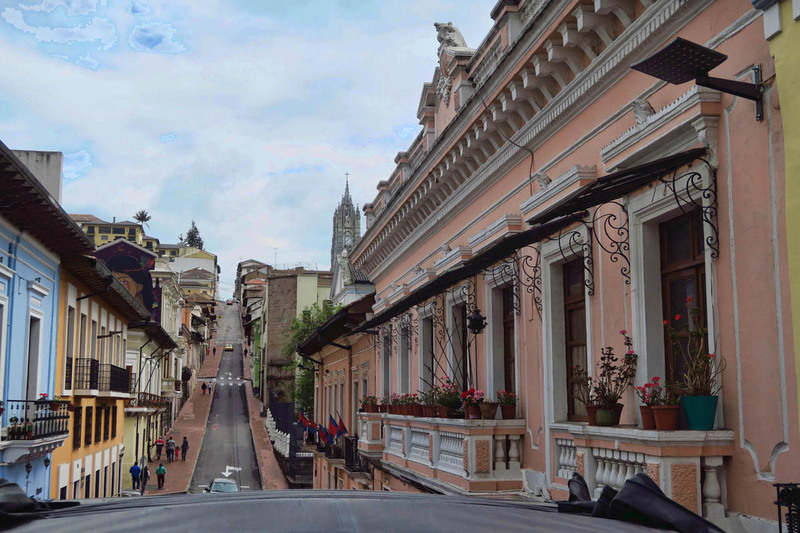 It’s a beautiful city nestled in the Andes against two volcanoes, which makes for easy navigation when walking…with a view of the mountains on your right, you’re likely headed south and vice versa. 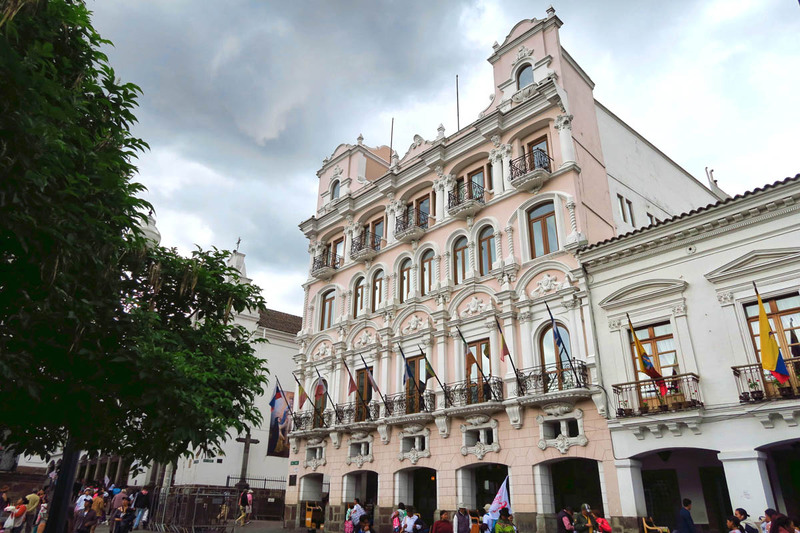 At the heart of the city is a gorgeous old historic center, a UNESCO World Heritage site since 1978. 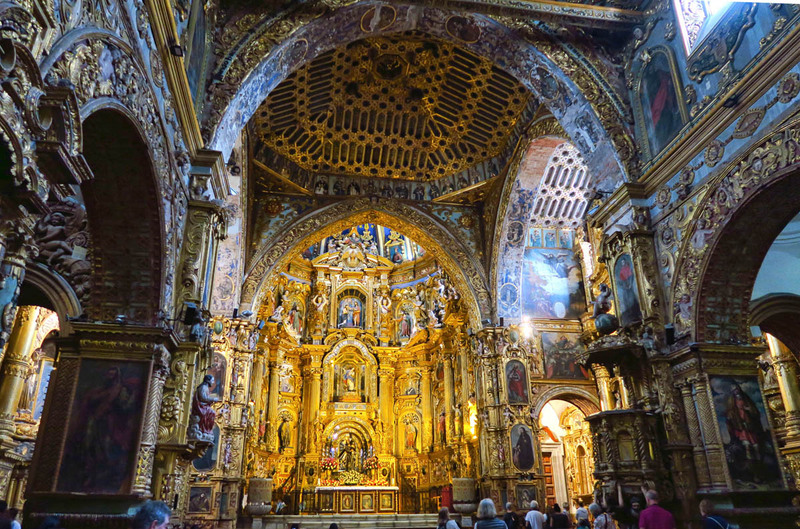 In fact, Quito was the first city to receive this designation which they describe as “the best-preserved, least altered historic centre in Latin America.” The baroque architecture and wrought iron balconies over the cobblestone streets, outdoor cafes and towering cathedrals, all give the feel of a European destination. 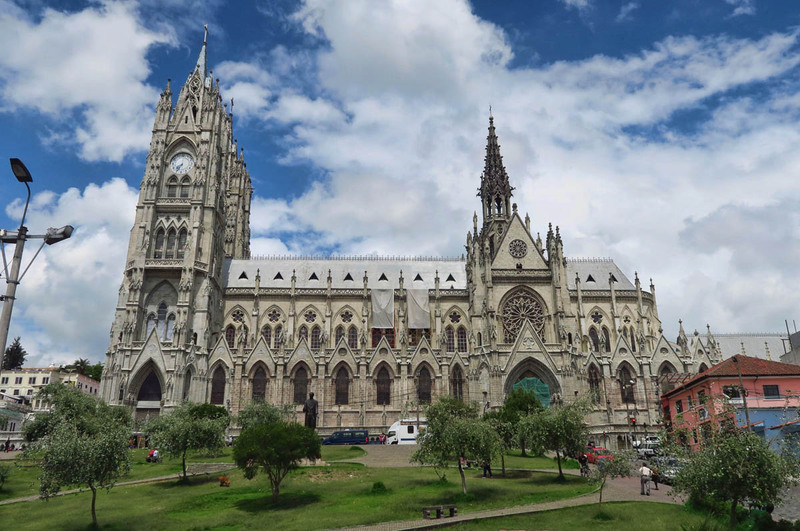 Another “don’t miss” stop on the tour is the Basilica, begun in 1892. 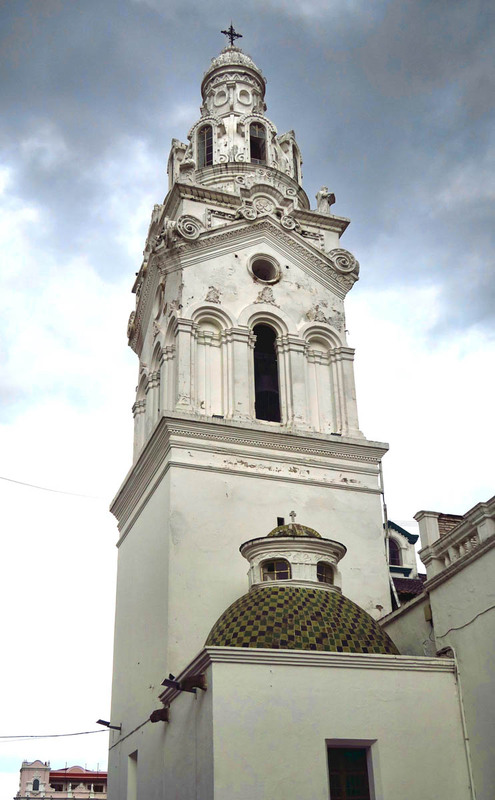 I regret being too cheap to pay the $2 admission to climb the bell towers here. 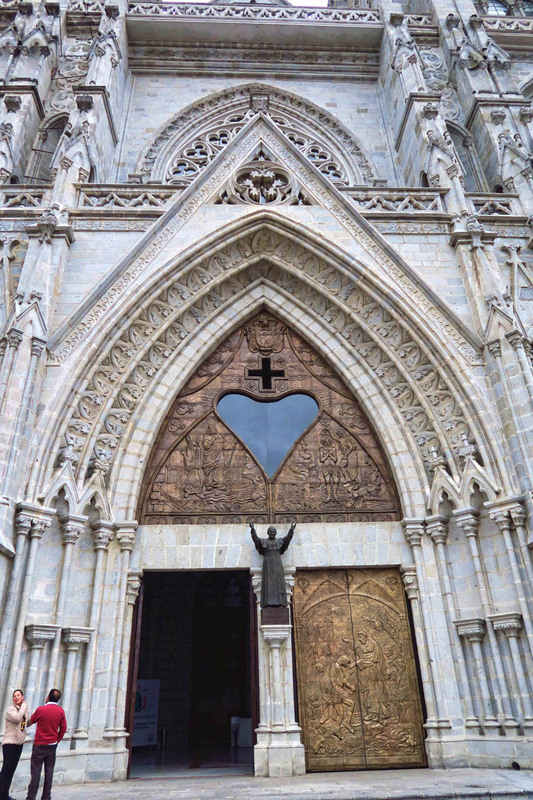 I loved the heart-shaped window above the basilica door. The open roof of the tour bus allows some views that would be hard to get at street level. I chose to base myself in the Plaza Foch (pronounced “Fōsh”) area, best known for its night scene, with a plethora of sports bars and smoky nightclubs. Not my scene, obviously, but it is also reputed to be the best location for discount travel agencies booking last minute cruises in the Galapagos….the primary reason I came to Ecuador. 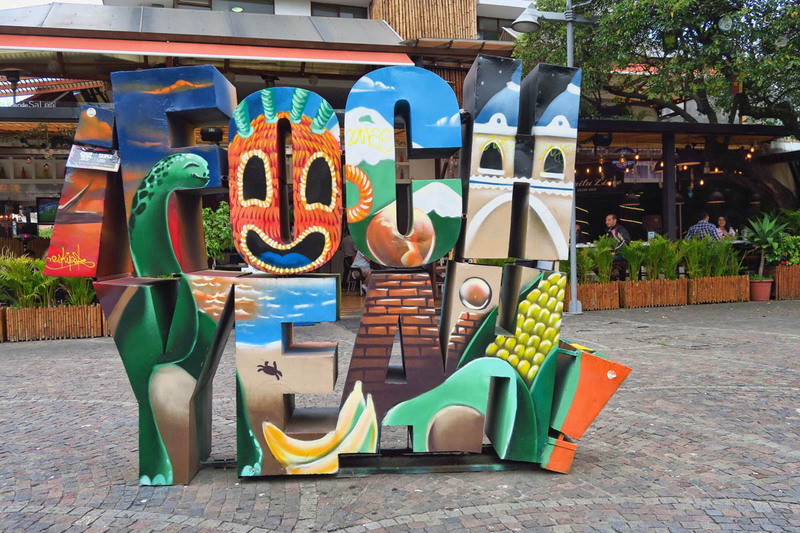 But like the central historic district, Plaza Foch area also comes with a warning label. 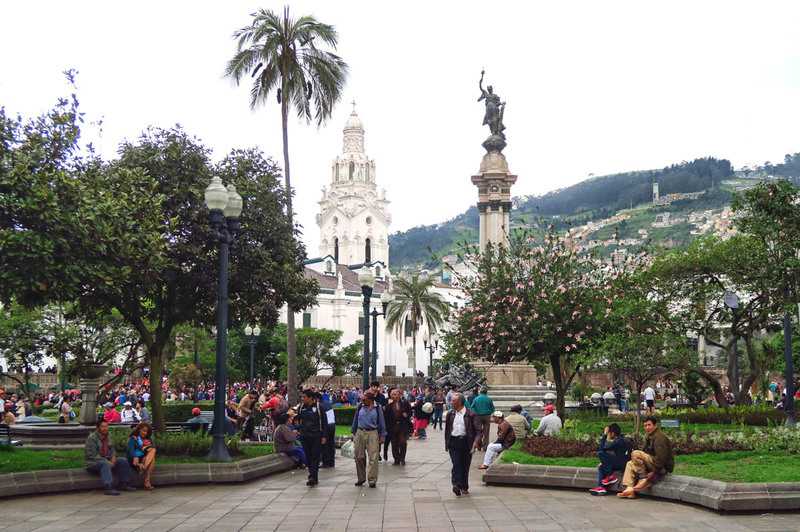 This entry was posted in Quito and tagged Ecuador, Plaza Foch, Quito City Tour by Suzanne. Bookmark the permalink. 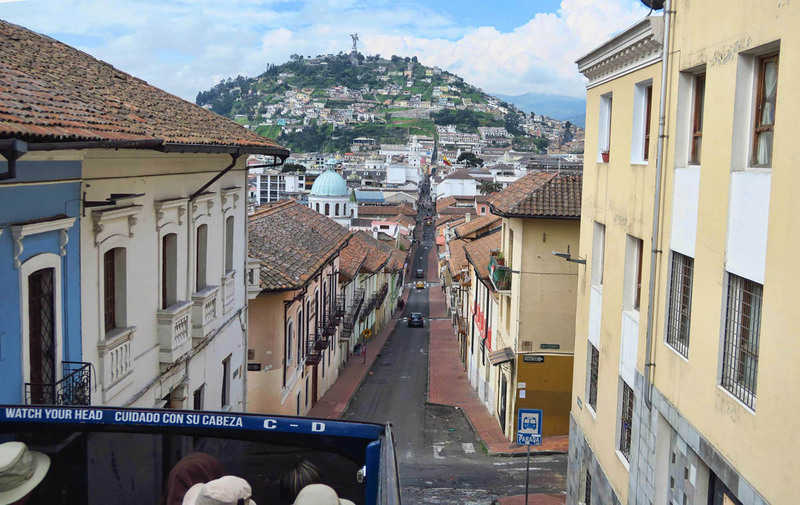 Quito is a beautiful city. I had my camera ‘appropriated’ there., but lost only pictures – not my memories. Your picture have it looking more colorful now than it was back then. I’d go back tomorrow! I certainly enjoy following your blog/experiences! A very colourful city. Sorry to hear about your robbery and good on you for continuing the tour. I have just read to incident update. All the best. Wow, what a beautiful city. Totally a shame that theft is so prevalent, hard to have fun when you are always on guard. A little paranoia is a good thing. 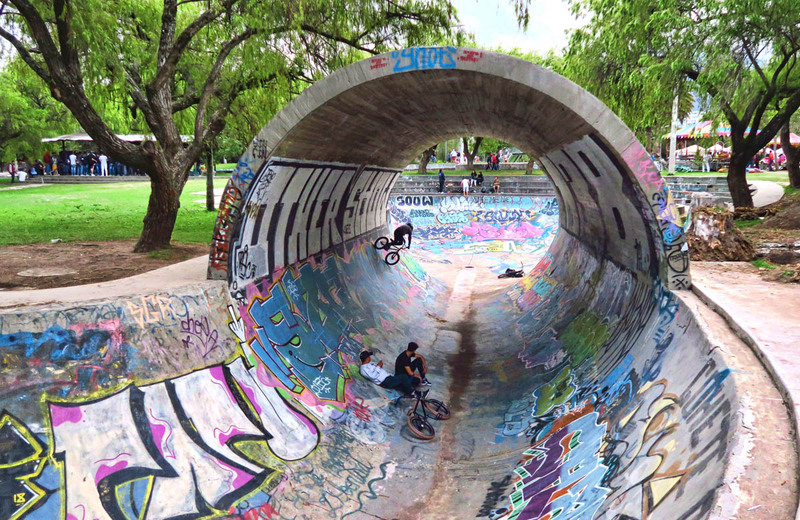 We are happy that you stayed on to capture all the sites in this blog. As always your descriptions in prose and pictures is fascinating. Thanks, and Don is a super brother. Glad you decided to carry on. Looking forward to reading the rest of the story. What a beautiful old city! I’m sure experiencing the theft was sickening but so glad you continued on!